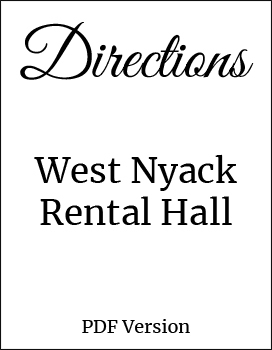 Whether you’ve been planning your celebration for years or just weeks, The West Nyack Fire Department Rental Hall will make it an event you will remember for the rest of your life. Nestled in quaint West Nyack just 20 minutes from New York City. It’s the perfect venue for any special occasion Weddings, Anniversary, Birthdays, Retirements, Graduations, Family Reunions, Conferences, Luncheons, Bar/Bat Mitzvah, or any type of occasion you choose will be a memorable one. Check to see if the date and time you are interested is available. Only dates booked are shown below, dates and times are subject to change. Contact us for the most up to date availability. Thank you for your interest in The West Nyack Fire Department Rental Hall. To inquire about your special event or to receive additional information please fill out the form below and provide us with the following information. West Nyack Fire Engine Company #1 Inc.